Radical Green ideologues live in a world divorced from reality. California Greens from Governor Brown on down have been blaming California’s drought on global warming, oblivious to the fact that rain and drought in the U.S. are historically normal. They never miss an opportunity to try and use natural weather events as an excuse to attack free market Capitalism. They particularly love to attack oil. How ironic that when the time comes to try and mitigate the problem, it’s the prosperity and ingenuity that flows from freedom to which they turn — and to oil. Californians just rolled 96 million plastic balls (at 36 cents a piece) into a reservoir that serves Los Angeles in an attempt to shade the water and curb evaporation. What are the plastic balls made from? Oil. This reminded us of the Seattle enviros who paddled kayaks to protest an oil platform oblivious to the fact that their own kayaks in effect came out of oil wells. The Greens may not get the irony, but CFACT’s readers do. This week over 10,000 of our friends shared our “meme” about California’s plastic balls with over a million and a half of their friends on Facebook. The kayak meme (below) blew away all records. Over 300,000 shared that one with over 31 million of their friends! 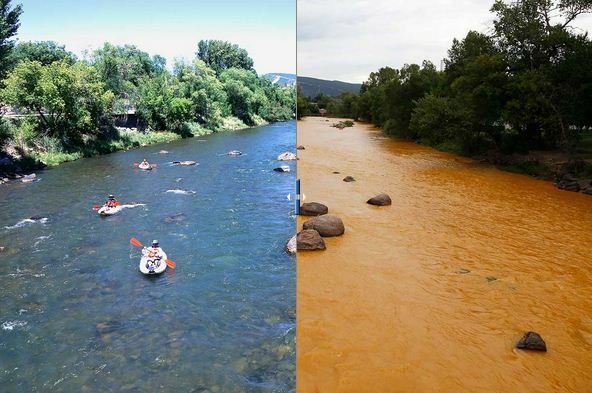 The EPA certainly provided a fine example of Green irony this week when they released polluted water from a Colorado mine and turned the Animas River yellow. Imagine how the Greens would be howling for blood had the polluted water gotten away from a productive business rather than feckless bureaucrats. The Green-Left despises the freedom that nurtures them. They have little notion of the hardships in store for them and for the environment if they succeed in strangling it. Let’s hope they never find out. Ironic too that the oil platform pictured is owned by Royal Dutch Shell – a company that openly acknowledges that CO2 emissions must be reduced to avoid serious climate change…and also publicly supports an international carbon pricing framework. Ironic too that you never hear the climate change-denying Craig Drucker criticize the petroleum industry when it agrees with the science of climate change. Good one… Protesters protest using items spawned from Big Oil… total ignorant dumb shits and unappreciative towards how Petroleum has uplifted ALL our lives.